Home » General » Pleased to Meet You » hey there hi there! :newbie alert! I am Carrie, aka buckinfun from NORTH CAROLINA My horses: perlino gelding APHA/AQHA bay mare AQHA black/white tobiano mare grey gelding mustang My king p-234 bay mare is due to foal March 20, 2012 The sire is an impressive bred (n/n) cremello My gelding is actually my son's. 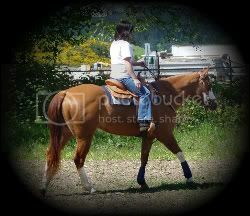 A gift from me He was going to be the herd sire at the farm I managed but he gelded instead, before I could afford him. The black n white mare was a rescue-free She's a spazz and needs some professional training. The Mustang is a rescue from the neighbors. They starved him and abused him. I confiscated him and now awaiting title from the BLM. He will be going to a professional trainer. He is not yet gentled because of his prior abuse. He can't get past it. I needed help.